Hope everybody had wonderful weekend. Yes we too have, but Texans failed miserably on Sunday’s NFL football game. They are good team, but last the last quarter, they played like they forgot to play the game. Beet root is a vegetable that has high appreciation in my house after carrot and red bell pepper. If beetroot stir fry is there, then rice will be going into the mouth without any added fuss in the case of my daughter. My son too likes beet root stir-fry just like his sister. So the weekend shopping will not be complete without the beet root in the grocery bag. My daughter like beet root chips from the Whole foods. First tried baking the chips, it failed, and then try to fry them in the oil also failed. So making beet root chips at home is stopped for the time being. I don’t know when I will try it again. If you have any tips let me know that may help in my future adventure. 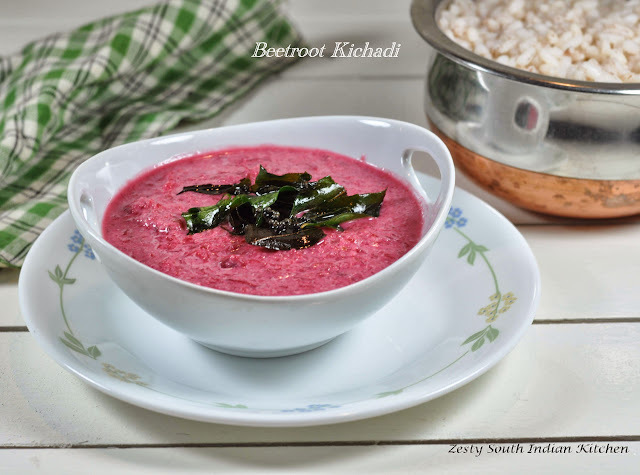 Beet Root kichadi is one of the recipe we make for our feast Sadya. Since beet root gives bright color to everything, this dish is very appealing. There are few curries we taste in a small amount; these are called Thodu curries, mainly pachadi and kichadi. In southern Kerala from where I am, Pachadi is sweet based made with fruits like Plantain, mango, and pineapple cooked jaggery and a paste of coconut, cumin seeds and green chilies. Where Kichadi is usually made with vegetables like Cucumber, okra, bitter gourd etc are cooked with yogurt and a paste made with coconut, mustard and green chilies. I wanted to try new kichadi recipe, as I have tried cucumber kichadi, okra kichadi and bitter gourd kichdi earlier. With the cucumber you need to cook without frying whereas the rest of them you need to fry the veggies and then cook. When I saw this recipe in onam edition of Vanitha (Malayalam Magazine) I decide to try it. I tried few of non traditional recipes, but they are not good as I wished. So Hubby said strict no to trying Pradhaman/ Payasam/ Pudding which are not traditional. At first I was so afraid that I am going to spoil the dish. Decide to give it try to find out its taste. One main difference between this recipe and traditional kichadi recipe is that no mustard seeds are grind along with coconut and green chili. Don’t be mistaken with Kichadi recipe of northern India. Actually it is more like risotto made with rice and lentils and spices. I like beetroot taste however the color mess all over the counter top it makes is not being my favorite. Still if you are having ardent fans in your house you have no choice. 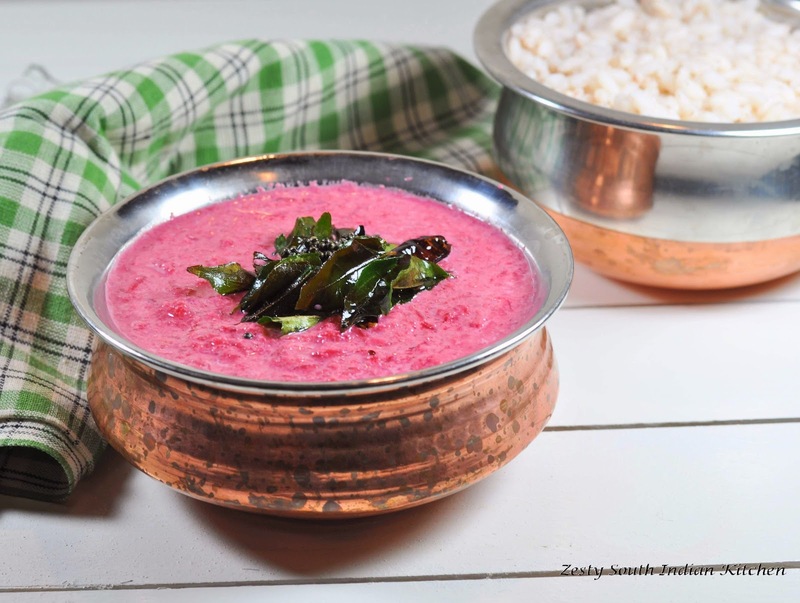 For this recipe you need to cook the beetroot first and then grate and add coconut paste and yogurt and then season with mustard, red chilies and curry leaves. It is easy recipe which tastes very good. You can’t serve this curry alone with rice, but along with some sides to go with rice it is great. Peel the skin of beet root and chop into big chunks and cook with 2-3 cups of water until it is cooked well or become very soft. Once it is cool enough to touch, grate them finely and set aside. In the mean time grind the coconut with green chilies into fine paste. 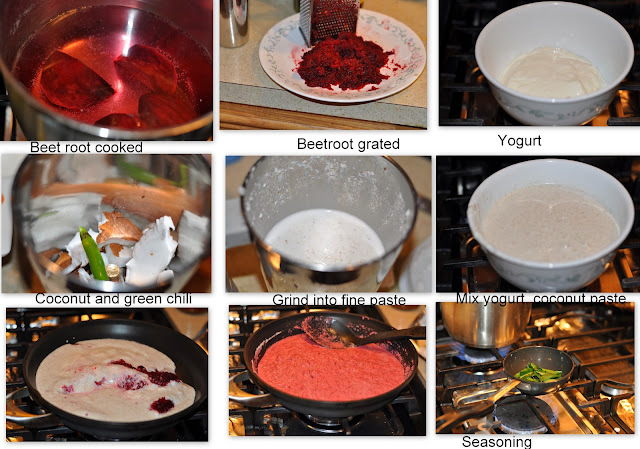 In a skillet add grated cooked beet, salt, yogurt and ground coconut chili paste and mix everything, in low flame. You can do this step without heating also. In another pan heat oil and add mustard seeds , red chili and curry leaves, when mustard seeds starts splutters remove from the fire and add it to beetroot yogurt mixture. Recipe adapted from Vanitha Magzine September 2013. Beetroot and yogurt is a very comforting yummy combination.. Love your colourful beetroot kichadi..
Love beetroot kichadi and make it all the time but in a little different way.I usually cut beet into pieces and throw it into chopper pulse a few times .Then cook it.Grating is really a messy job esp with beet. You are right, anything with beet is really messy.But my kids love this veggie a lot. I make it with raw beets..shall try Ur version once! Looks yum! yummy tempting and delicious with awesome clicks. I simply love your new site btw! This is something new but love beets simply of its colour. If you don’t ask me to chop it, then I am the first one to eat this veggie. very appealing.. I love beet pachadi, it sure looks yummy. Served with brown rice a great combo. Swathi, how are you? Texans beat Chargers and I was not a happy camper. But I thought that you would be very happy. I am not a great fan of beets, but it looks delicious. The colour and taste of this dish always makes it stand out, especially when served during the sadyas. Very nice Swathi!! Looks delicious Swathi, I love beets with curd..
Looks so yum!…perfect with hot white rice. love the new look of the blog. dish looks so vibrant in color. Wooo.Thank u dear 4 Iron rich recipe..
WTML EVENT On going at my blog.Kindly participate. Hi swathi KICHADI looks delicious. This is such a lovely colored yogurt sauce! Congratulations again. I loved the new look and your picture too. 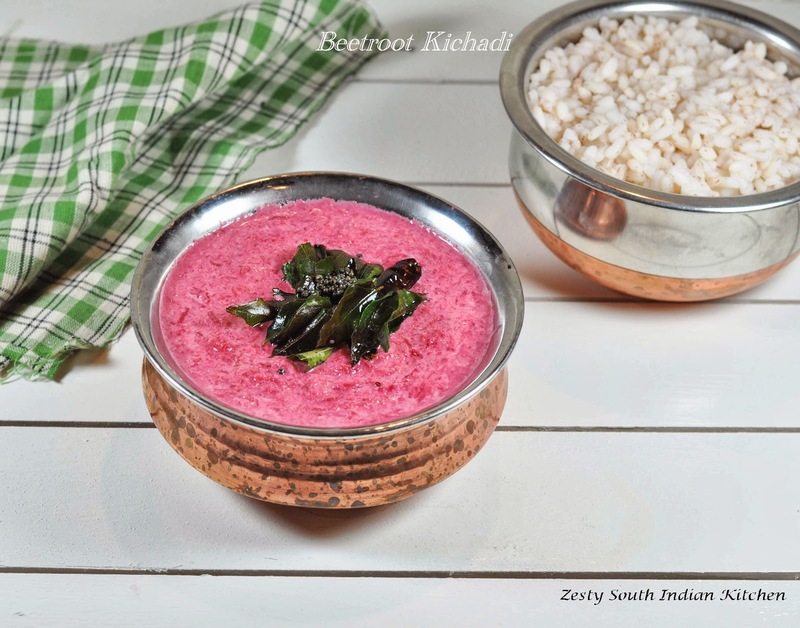 Beet root kichadi looks delicious . Wonderful clicks and your new website looks awesome ! Beets make such pretty dishes and delicious ones too! They are messy but so good for you – we love them roasted. Your new blog design looks nice and so does the Khichdi. Will try it this week. First time here. Lovely website. Colorful snap swathi. 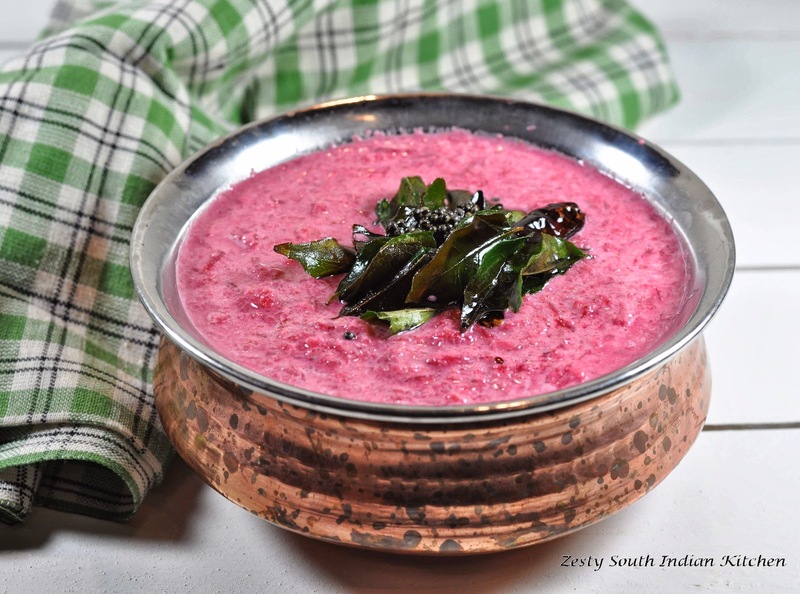 Check out my beetroot pachadi too. Se ve tan rico! y perfecto con arroz me encanta la remolacha,abrazos.